The Sutherland Shire Heritage Festival is on now and if you're looking for something to do this weekend why not give find our a bit about the history of our local area. The full program of events is available from the Sutherland Shire Council web site but forgive me if I focus on one of the events that are being run by our own Local Studies Librarian. Once you've had a wander through the exhibition make your way up the hill to Cronulla Park and enjoy the sounds of the Symphony by the Sea, a free performance by the Sutherland Shire Symphony Orchestra. 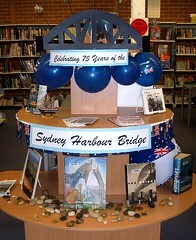 In order to play our part in celebrating the Sydney Harbour Bridge's 75th Birthday celebrations, we have a great Sydney Harbour Bridge display at the moment along with some of the library's best books on the Sydney Harbour Bridge. I walked the bridge last Sunday on the open day. Even though I have walked along it before when I looked straight up after reaching the middle of the bridge I was amazed as to how big it is! The HSC lending resources collection at Caringbah is proving very popular and we have noticed a high turnover of items. If you're doing the HSC in 2007 ask us about the many print and electronic HSC resources that we have. Just last week we have had a new staff member join the Caringbah team. Welcome Matt! I am sure that all our customers will appreciate Matt's friendly demeanour and excellent customer service. Rhymetime has just started at Caringbah library. Rhymetime is a storytime session for babies up to 18 months of age. Rhymetime sessions typically consist of simple and poplular rhymes like twinkle twinkle little star and songs that involve hand actions (like open, shut them) and a couple of simple board book stories. Our Rhymetime sessions always have the same opening and closing songs. Caringbah has rhymetime every Thursday at 11am. Of course our popular storytimes are still on every Tuesday morning at 10:30am. Still talking about children's activities, the Easter holidays are approaching fast and at Caringbah we are holding our Pirate Fun activities on Tuesday the 10th of April- that's the Tuesday after Easter- at 2pm. Speaking of Easter, don't forget we will be closing on Good Friday 6 April and reopening on Tuesday 10 April, so grab your Easter reading material and avoid the rush! Finally, did you know that Caringbah also has a DVD collection? Ask us if we have your favourite movie/tv show/documentary on DVD! Here are just a few of our new DVDs in order to whet your appetite: An inconvenient truth, Snakes on a plane, and The devil wears prada. Have a happy and safe Easter - and don't eat too much chocolate! Law Week, March 25- 31 2007, is a national event that presents members of the community with an opportunity to participate in education programs and activities that focus on relevant legal issues which ultimately protect the best interests of our citizens. As part of the Law Week Program Engadine Library will be hosting a free seminar on family law on Thursday 29 March from 10am until 11.30am. Lawyer and Family Law Specialist, Debbie Morton, will talk about the recent changes to family law in Australia since the Family Law Amendment (Shared Parental Responsibility) Act commenced in July 2006. The talk is free but bookings are essential. For more information or to reserve your place telephone Sutherland Library on 9710 0570. Durin' the upcoming Easter School Holidays the Sutherland Shire Libraries will be having all sorts o' Pirate Fun! Th' ever-popular Trevor's Drawin' Workshop returns, along with plenty o' stories, shantys, films and craft. Shiver me timbers! Make sure ye be visit'n our Events Calendar smartly for all the details. If ye miss out ye be wishin' ye walked the plank! In celebration of the recent surf lifesaving event held at Cronulla Beach and the upcoming Cronulla Heritage Photographic Exhibition at the Cronulla Surf Lifesaving Club we have added a new Surf Lifesaving Picture Trail to Picture Sutherland Shire. Browse through some historical images of Surf Lifesaving events at the Cronulla beaches. The Photographic Exibition is just one of the events happening as part of the Sutherland Shire Heritage Festival 2007. You can find out more about the Heritage Festival on the Sutherland Shire Council web site (the link above) or by telephoning Louisa Mawer on 9710 0992. Collection Capers is a monthly newsletter of NEW interesting or unusual non-fiction added to the Sutherland Shire Libraries collection. We tell an average of six lies a day, psychologists believe. So the next time you speak to someone, the chances are that you will be lied to, or that you will lie. The author looks at some of the great liars of history, and reveals how scientists can observe the brain as it suppresses the awkward truth, in favour of a convenient lie. Of course lies are not to be confused with non-core promises, that’s just election rhetoric. And nobody tells the truth then. Intended for those interested in American Independent, low-budget and maverick filmmaking, this book looks at the history of American 'indie' cinema, from its earliest incarnations in the 60s and 70s to the rise of Spike Lee and the Coen brothers. Profiles films such as Sideways, Mean streets, Go fish and everyone’s favourite, Eraserhead. No billion dollar Hollywood dross here. Sets out to answer a question: how do you explain the oppression and brutalization of half the world's population by the other half, throughout history? This book looks at both historical and contemporary attitudes to women. Every spring, the clocks go forward, and every autumn they go back. This book explores the contentious story of this deceptively simple attempt to regulate the sunlight hours. It brings together the historical, political, and technical aspects of the story behind the movement for DST. It doesn’t explain why a teenager stays in bed until after midday. Extraordinary rendition, is the USA’s practice of kidnapping suspects, flying them to an undisclosed location in a third-world country, and letting them be tortured to force a confession. This allows the US to deny allegations of direct torture by themselves. Cute isn’t it. This information can then be used in military trials which have about the same degree of justice as a hearing in Stalin’s Russia. Offers a global account of the place of technology in twentieth century history. This book aims to challenge the idea that we live in an era of ever increasing change, where only the newest is best. But as we know some earlier technologies still work just as well as ever. The idea of increasing change and the consumption that goes with it may bring the world to the edge of disaster. And there’s something obscene about a $100,000 car. At first I thought this was a book about detestable meals, food so bad you thought it a crime to have it on a plate. But no, it documents true crimes, but with a food twist. Jaime Oliver meets P.D. James. Perhaps it not surprising that some brutal crimes take place inside eating establishments. After all, that’s where the shock jocks make their deals. Wild Bill Hickok got shot in a hotel while having his back to the door. After reading this you might want to check your next seat in a restaurant. Eat in tonight? The story of Haregewoin Teferra who after her beloved 23-year old daughter was consumed by an unnamed sickness sank into a deep, reclusive depression. But, when the priests brought her two children, AIDS orphans, she took them in, and found a new reason to live as she watched them grow strong, happy, and healthy. Since then her she has raised and educated dozens of children and given hope where previously there was despair. A woman is brutally murdered in Melbourne in 1892. This true story will take readers back to a time when the now prosperous city was in a time of economic depression, when horrific crimes abounded. It recreates a time when life was more hand-to-mouth and scruples were less and survival was more instinctual and many people lived on the edge of the criminal world. Looking at Melbourne over the last few years of gangland war you may wonder what has changed. The idea of mapping the world is not all that old. Even 500 years ago most people had no concept of the shape of the world (except that it was flat and there were dragons just beyond the next village). The dawn of exploration, breakthroughs in astronomy and the quest for knowledge led to the explosion of maps. As early as 600 B.C. there were maps of the Mediterranean (showing where the best olive oil could be bought). This wonderfully produced book tells us of the influence of maps on history and civilization. Love boat, shining and new, come aboard, we’re expecting you. Expecting you to get drunk or raped, fall overboard, get put of the boat in some foreign port and generally act like a goat, that is. What you pay for ain’t what you get. Hopefully for $28,000 as the lowest fare a trip on the Queen Mary 2 will be the trip of a lifetime, not the last trip of your lifetime. Captain Jack Sparrow has got nothing on the thieves and brigands running some cruises. Looks at 25 distinctive an influential examples of modern landscape. New materials plus the influence of modernism in art and music made the freeing up of architecture and design possible. The examples of Frank Lloyd Wright, Le Corbusier and the Bauhaus were instrumental in the new directions of the mid and late 20th century. They were the giants of the Gilded Age, a moment of riotous growth that established America as the richest, most inventive, and most productive country on the planet. The ruthless, competitive Camegie, the imperial Rockefeller, and the provocateur Gould were obsessed with progress, experiment, and speed. They were balanced by Morgan, the gentleman businessman, who fought, instead, for a global trust in American business. Through their antagonism and their verve, they built an industrial behemoth - and a country of middle-class consumers. The tycoons tells the incredible story of how these four determined men wrenched the economy into the modem age, inventing a nation of full economic participation that could not have been imagined only a few decades earlier.